Superhero movies are everywhere, and 2018 is set to be infested with so many. We may be hotly anticipating the biggest Avengers crossover yet, the return of the Incredibles, and more, but there’s yet another one slipping into cinemas this summer. Enter the teaser trailer for Teen Titans Go! to the Movies, one with madcap superhero mocking, and an epic 20-second fart joke! Based on the highly-successful show Teen Titans Go! on Cartoon Network, this movie follows the titular superhero team, who are yet to have their own movie, setting off to (what else?) get one made for them! This big screen debut of the Titans aims to be a “kid-appropriately crass and tongue-in-cheek play” on the current superhero blockbuster craze, along with some musical numbers thrown in. With the same crew behind the series working on this, the movie will be helmed by series co-creator Aaron Horvath, who is co-directing with Peter Rida Michail, and co-writing with Michael Jelenic. Despite being produced theatrically by Warner Bros. Animation, the Warner Animation Group banner appears to be absent from the film’s marketing. 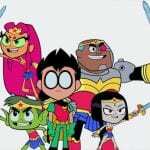 The main voice cast will also be reprising their roles, with Greg Cipes as Beast Boy, Scott Menville as Robin, Khary Payton as Cyborg, Tara Strong as Raven, and Hynden Walch as Starfire. Also joining the cast are Will Arnett (The Lego Batman Movie) and Kristen Bell (Frozen) playing Slade and Jade Wilson respectively. Arnett also serves as one of the producers. What we’ve been shown seems like a mixed bag. 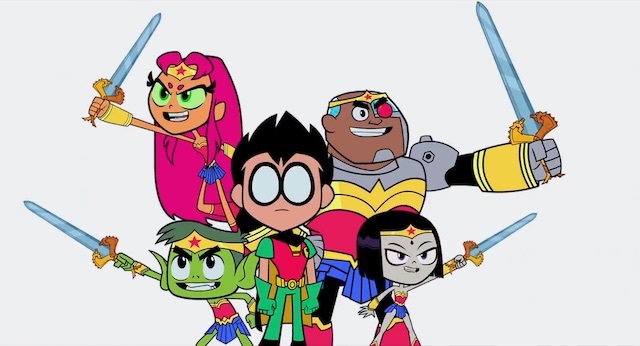 While the animation quality is barely better than its TV counterpart, and that fart joke is obviously too lengthy, the jabs it takes on Wonder Woman, Aquaman, and the Titans themselves are surprisingly very amusing. Its self-aware satire like this that makes the typical superhero movie more refreshing. Of course, the show’s vocal haters will be tearing this movie up, and to them, I’ll just remind them that they’re not being forced to watch it. As for fans and those curious, it’s going to be a wait-and-see game on how the finished product will end up. Whether you want it or not, Teen Titans Go! to the Movies will be going to the movies on July 27, 2018, via Warner Bros. Pictures. Did the teaser make you laugh, or cause you to dread for something worse? Titans, comment!